Director/Screenplay – Brad Bird, Co-Director – Jan Pinkava, Story – Brad Bird, Jim Capobianco & Jan Pinkava, Producer – Brad Lewis, Photography – Robert Anderson & Sharon Calahan, Music – Michael Giacchino, Supervising Animators – Dylan Brown & Mark Walsh, Production Design – Harley Jessup. Production Company – Pixar Animation Studio/Disney. Remy is a rat living in France who has an extraordinarily well-defined sense of taste. This makes him stand out from the other rats – where they are happy eating garbage, Remy desires fine dining. Remy sneaks into a nearby cottage and watches the tv cooking shows hosted by celebrity chef Auguste Gusteau and learns how to cook from a copy of Gusteau’s book ‘Anyone Can Cook’. Found by the owner of the house, the rats are driven out. Remy goes back for the copy of Chef Gusteau’s book and is separated from his family. He floats down river into the sewers of Paris. Guided by the late Chef Gusteau’s ghost, he eventually emerges into the kitchen of Gusteau’s restaurant. There the autocratic Chef Skinner gives the shy young Alfredo Linguini a job as cleaning boy. When Remy sees Linguini making a mess of the soup, he intervenes to throw in a mix of ingredients and save the soup. The soup proves an unexpected hit with the customers and Skinner demands that Linguini continue cooking. Linguini and Remy come to an arrangement with Remy hiding under Linguini’s chef’s hat, controlling his movements by tugging on his hair. The scheming Skinner determines to unmask the truth. When he discovers that Linguini is Gusteau’s son, Skinner plots to prevent him from claiming his inheritance of the restaurant. Ratatouille was the eighth film from Pixar Animation. It follows Toy Story (1995), A Bug’s Life (1998), Monsters, Inc. (2001), Finding Nemo (2003), The Incredibles (2004) and Cars (2006) and was followed by Wall-E (2008), Up (2009), Toy Story 3 (2010), Brave (2012), The Good Dinosaur (2015), Inside Out (2015) and Coco (2017), as well as sequels to many of these. Ratatouille was the second Pixar film made by Brad Bird, an outsider who had previously directed the highly acclaimed The Iron Giant (1999) and then joined Pixar to make The Incredibles. Bird inherited Ratatouille from Czech animator Jan Pinkava, a promising star at Pixar who would have made his feature debut with Ratatouille but was removed from the director’s seat part way through production. Ratatouille was a mixed success when it opened (although did eventually become the eleventh top box-office earning film of the year). Pixar blamed this on Disney’s marketing campaign, swearing that they would do all their own marketing campaigns themselves thereafter. 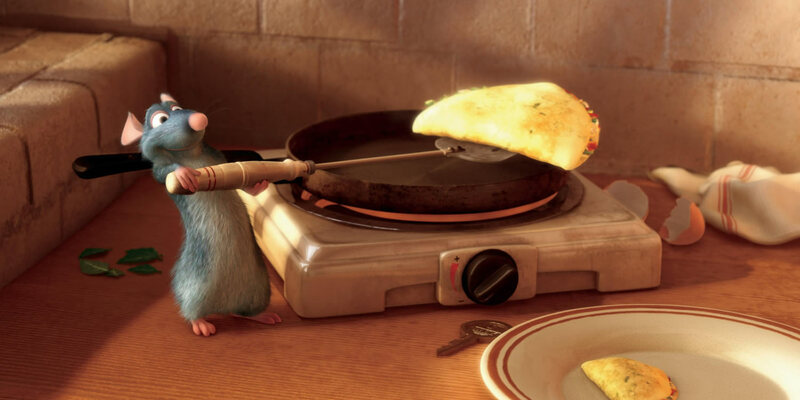 It may have been that Ratatouille was the wrong concept for an animated film at the American multiplex – try and envision a cross between the Food Channel and the recent animated rat story Flushed Away (2006). An animated film set around the snobbery of fine dining may have been too highbrow for the great unwashed American public – not to mention a film that vaunts the superiority of the these days American-reviled French culture. The Disney promotion campaign even had to go to the extent of educating audiences how to pronounce ‘ratatouille’. All of Pixar’s films come with a similar excellence of quality – it is difficult to stand back and look at their body of work and decide which of their films you think stands out over the others. That said, while still maintaining the same quality of excellence as the others, Ratatouille is probably their most subdued film. It has the same character arcs – the familiar oddball hero who only needs to convince the world of his unique gift in order to be accepted (Bird seems to have substantially borrowed the plot of the creative genius and his talentless frontman from the oft-filmed story of the French swordsman/writer Cyrano de Bergerac); a slimy double-dealing villain (as well as a scene-stealing voice cameo from Peter O’Toole as the food critic); a dash of romance; and a cast of likeable supporting characters. All of this is rounded off with Pixar’s expectedly excellent quality of animation – there are some lovely panoramas of Paris and the depth and detail of the kitchen and Parisian streets comes with casual excellence. The human characters have all been drawn in an exaggeratedly stylised manner – one was constantly reminded of the excellent French-made The Triplets of Belleville (2003). All of the elements come together appealingly, although there is just that smidgen less of the high energy ebullience that usually comes in a Pixar film. A degree of slapstick comedy has crept in in Brad Bird’s direction – sequences with Remy causing Linguini to gyrate all over the kitchen as he bites him; a high-energy sequence with Remy racing around the kitchen and restaurant to avoid being found; a scooter race through the streets of Paris; and an endearing montage sequence as Remy initially tries to coordinate Linguini’s actions. There is also the slight feeling, perhaps due to the project’s troubled genesis, that Ratatouille has been put together as a slapdash project, more than one that wins through on its natural-born charms. Ratatouille is never a film that is constantly making one laugh out loud, not in the same way that Brad Bird’s The Incredibles was packed with side-splitting gags. The secondary characters seem underdeveloped – Colette starts out as tough and feisty but in no time dissolves into a standard romantic supporting character; the film introduces a bunch of eccentric outsiders working at the restaurant, yet they have no role in the film and when it comes to climactic scene they even end up exiting en masse. Chef Skinner seems defined only in terms of a polarities – Remy supports fine dining, while he is trying to sell junkfood – while the plot about Linguini being Chef Gusteau’s son comes out of nowhere and feels standard. The film also ends weakly – the rats coming to save the day and wow the critic has a triumphal kick but the coda the film goes out on mutes such a triumph. 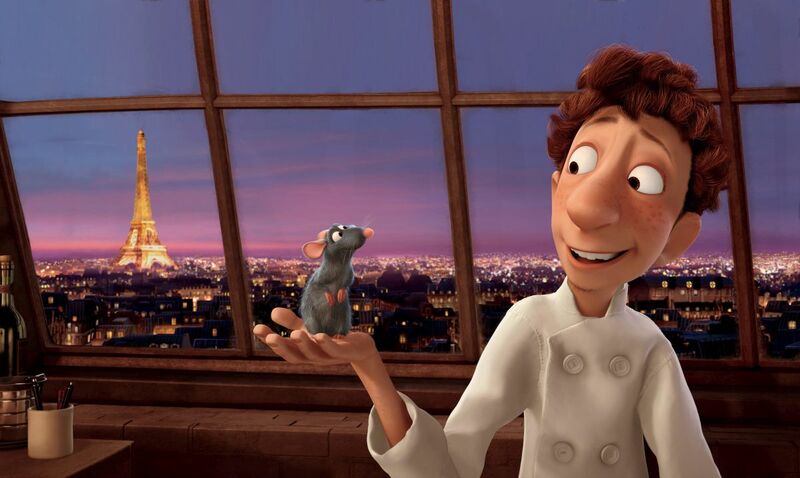 For the most part, Ratatouille makes its way there with charm and likeability. Maybe it is that Pixar have raised the bar so high that what would be a top quality film for any other studio feels slightly lesser coming from Pixar. Brad Bird next went onto direct the live-action Mission: Impossible – Ghost Protocol (2011), followed by Tomorrowland (2015) and then his return to Pixar to make Incredibles 2 (2018).